The ride, based on the film by the same name, has now opened at the Staffordshire theme park. The new rollercoaster which is made out of wood and involves fire and simulated flames, engages with the sense and uses sights, sounds and smells from a bygone era to set the scene. The ride incorporates a giant, flaming Wicker Man who stands six-stories high and a wooden track which will race through the flaming structure of the Wicker Man three times during the ride. 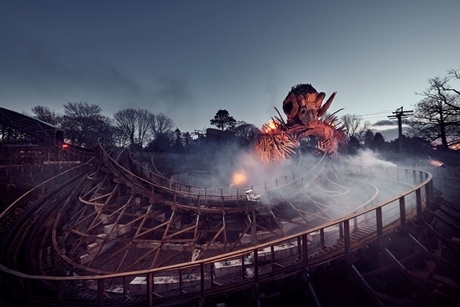 Wicker Man is said to be the UK’s first new wooden rollercoaster experience in 21 years. The roller coaster features fast train like carriages and does not include any loops. There is plenty for schools to get involved in when visiting the theme park, besides enjoying the rides. The education centre is set out like a lecture hall in order to give older pupils an initiation for when they enter college and university after leaving school. There is also a studio whereby classes can be split into teams to look at the different rollercoasters and how they work. Besides this there is also a number of workshops related to different subjects that school groups can enjoy. In fact, there are over 30 different educational experiences to choose from. The expert led talks and workshops range in suitability for Key Stages 1 to 5. The park also hosts school events throughout the year which involve pupils in a number of themes such as Dance and Business. The Street Dance event, for example, teaches pupils a number of routines for them to then act as performers at the resort during the event.